Anker’s offering a 2-pack of its super tough Lightning cable for an unbelievable price of just $16.99. Pick it up today before price returns to normal! If you’re a iPhone owner, or someone who uses an iPad other than the 2018 Pro variety, you’re probably very much aware of the need to have a Lightning cable in every room of your home. We’re not sure which gremlin is stealing our Lightning cables, but we’re pretty sure we can’t be the only ones that it visits! For that reason we’re always on the hunt for great deals on Lightning cables, and today we have a pair of cables on offer at a great price. It just so happens that they’re from the fine folks over at Anker, too. This bundle of two Lightning cables would normally sell for around $24, but right now the pair can be yours for just $16.99. That’s a $7 saving for two six foot cables, meaning you won’t need to be quite so close to the wall charger to get juice into your iPhone or iPad the next time it needs a top-up. You’ll be the talk of the town with these cables, too, thanks to their stunning red color. It’s almost 2019 – nobody wants to live with boring old black or white cables, right? Each cable is MFi Certified, meaning it’s guaranteed and verified to work without any issues. 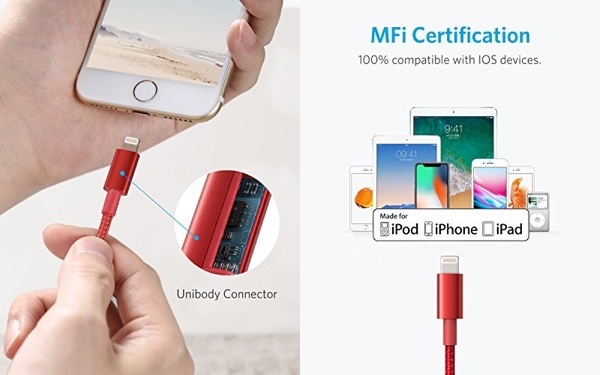 The MFi Certificate means guaranteed compatibility, something that the most inexpensive cables you will find on Amazon simply cannot offer. You don’t need to worry about these cables falling apart like some rubber cables, either. They’re nylon-braided, and they come with a lifetime warranty to back that up, too.